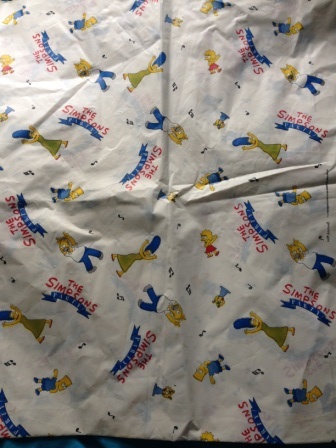 I don’t know much about this, apart from the fact that it’s a tablecloth from 1990, featuring the family in weird, apparently-mid-dance poses, with a logo proclaiming this is “The Simpsons Party”. I’ve seen other party favours, like paper plates and hats and everything, from around the same time, but this doesn’t seem like it’s part of that set: most of those follow the pink colour scheme they used a lot in the early years of the show. Anyway, expect to see a LOT more of this around here. It’s going to be the background for basically all future photos. This entry was posted in 1990, Bart, Food stuff, Homer, Household, Maggie, Marge, Misc and tagged 1990, bart, homer, lisa, maggie, marge, party favours, Party tablecloth, tablecloth, The Simpsons by Mick Irving. Bookmark the permalink.